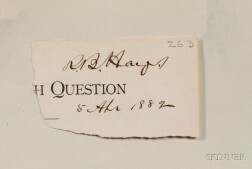 Save your search - find out immediately when "Rutherford B. Hayes" is available at auction! Coolidge, Calvin (1872-1933) and Grace Anna Goodhue (1879-1957), [with] Rutherford B. Hayes (1822-1893) Three Signed Cards. Lincoln, Abraham (1809-1865); Ulysses S. Grant (1822-1885); and Rutherford B. Hayes (1822-1893): Cartes-de-Visite.